Well, I imagine lots of you are wondering just the bloody hell all of these gadgets are for, so I'm going to try to explain it to you. Psionics is the art of manipulating psychic abilities by means of physical instruments. Now, these instruments may be big bulky things with lots of dials and lights and amplifiers and stuff or they may be as simple as a pattern printed on a piece of paper. But the important thing to remember is that they all work. Part of Psionics is the art of Radionics which was discovered, or invented, by Dr. Albert Abrams in the early part of the last century. One day in 1910 he was in his office with a patient, percussing him which does not mean he was swearing at the man but rather tapping his tummy to see how his innards sounded. It's a doctor thing. Anyway, Doc Abrams got a kind of strange noise when the man faced one way but a normal noise when he faced another. So the good doctor spent the afternoon marching the man around the office, tapping his tummy while the waiting room outside was filled with fuming other patients waiting to get their tummies tapped. The upshot of all this was that the good doctor decided that the magnetic field of the earth had something to do with the differing tummy noises and so he set up a series of experiments to find out if different phyisical and disease states would cause different tummy sounds. He procured an assistant and a length of wire, a handle and two aluminum discs. One disc was fastened to the forehead of the assistant by a rubber band and wired to the other disc on the handle. While a second assistant held the handled disc over tissue samples with various diseases, Doc Abrams tapped the tummy of the first to see where on the tummy the different sounds were coming from. This yielded all kinds of useful albeit rather strange information until one day disaster struck! The same sound came from the same place on the tummy from two different diseases! Fortunately for the world, Doc Abrams was a scientific fellow and thus had in his laboratory a death ray -- er --sorry about that, a three dial resistance box which all good scientific people had laying around in those days. They never used them but it was important to look the part. 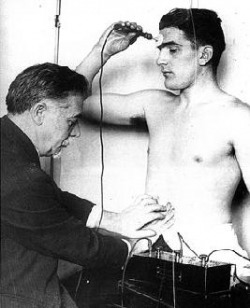 Well, the good doctor took a page from Alexander the Great and cut the Gordian Knot, well actually he cut the wire, and fastened it to the connectors of the box and then fiddled with the dials while tapping the assistant's tummy. And yea, lo and verily there were different sounds again at different dial settings. The world was saved!!! It all began with this little box thing that you see at the bottom of the page. And he was off and running! For the next fourteen years until he up and died, Doc Abrams designed a plethora of instruments, all for healing unfortunately, to use what he called his Electronic Relations of Abrams (he assumed that what he was doing was somehow electrical). Of course there was one little problem--finding assistants willing to stand all day and have their tummies tapped. Abrams solved that by inventing the Reflexophone which looked like a bongo drum on its side and sort of acted like a portable tummy. That became the precursor to the stick pad. Now the reason I just bored you with all that is because it's a good fun story and I love to tell it. Modern Psionics has actually rather little to do with Abrams because we don't think of it as purely electro-magnetic and we aren't that interested in healing, well, at least I'm not. There are three basic principles of Psionics. 1.If it exists it can be known. 2.If it is known it can be studied. 3. If it an be studied it can be manipulated. Psionics is a means of gathering information and then manipulating that information to bring about results. Information is gathered by variants of dowsing, using various tools such as the pendulum or stick pad and then manipulated either by translating the information into a numerical readout on a radionic instrument and then working the numbers or by direct influence such as by using an amplifying pattern or hooking the helmet into the system, using the instrument to lock onto the target and then visualizing the result. Numerical manipulation is used most often in healing. That is done by placing the witness (which can be anything that represents the subject) on the witness plate of the instrument and then turning each dial while mentally asking what is the rate for the condition in question. On a three-dial machine using dials calibrated 0-10 the rate might be 1.4, 5, and 2.3. To cure that condition a balancing rate is used. That is found by subtracting all three rates from ten so the dials are then reset to 8.6, 5, 7.7. This rate is then left on the machine with the witness and by some means we have no idea what the disease condition is removed from the energy field of the body ultimately resulting in a physical cure,or at least that's the theory. It doesn't always work that way and sometimes people don't get well but it works often enough that it's worth the try. Now, that technique can be used for any psychic influence as well, so if you have a troublesome thoughtform floating around, you can balance that out of existence as well. The capacity of radionic devices to lock onto a target is extremely useful in remote viewing and direct psychic manipulation. In those cases you take what we call a contact rate for the subject and that rate is like an open telephone line to the person. You then hook up your headgear and visualize either the result you want or send the message you want the subject to receive. So there you have the basics. The rest of what you need is pretty much explained with the descriptions of the instruments so have fun. And here is Doc Abrams' book.